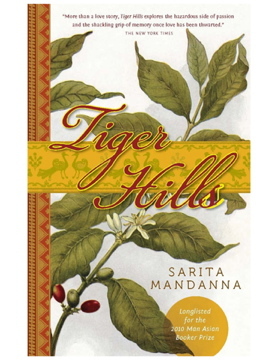 Would you like to win one of 5 copies of Tiger Hills by Sarita Mandanna? Please leave your name and email in the comments section below. When you do that, also please give us some feedback on this blog/and articles you have read here. We would also love to hear your recommendations for author interviews, articles and ideas. 5 winners will be randomly selected on Valentines Day, Thursday, February 14, 2013, from the comments section below. Look forward to reading the book. Suprose always manages to bring forth interesting books and very erstwhile south Asian women authors. Always a pleasure reading! Great blog and what a generous idea. I am always on the lookout for good reads. I enjoyed reading Tiger Hills very much and would love to gift it to others - enjoyed this interview with Sarita Mandanna as well! I'd recommend interviewing children's author, poet and storyteller (my Mum! )Rosemarie Somaiah. I have just discovered your blog and I am so grateful for having found this, and for all your hard work here. I want to become more familiar with Indian and Indian-American literature, but every step for me, a white American recently captured by an interest in Indian culture through Indian friends and a few Hindi classes, is an introduction. There is a need to raise the voices of Indian writers all over the world, and this blog could be a good resource for me. Bahut, bahut shukriya. "business of books", regarding memoir, publishing, the international, cross-cultural spread of contemporary literature. I like how this blog shows world-famous authors most people know (Tagore, Rushdie)and contemporary authors I might like to begin with. It's a way for me to get my feet wet studying writing and Indian literature from the computer. Thanks Laura. Please spread the word and keep coming back. We have lots more interviews and how to pieces coming soon. I received your book some time back - Thank-you for taking the trouble to send it again after the mailing problem. I can't wait to start reading it this week. Again, thank-you so much! Came here through desilit on FB-- so glad you posted the Tiger Hills drawing there! Look forward to reading this novel and your excellent SA resource. Also wanted to let you know that I'm guest editing an issue of the literary ezine, Sugarmule. It's a special South Asian issue 'Borders & Partitions: South Asia, Diaspora'. It will be available on line from May 2013 and I would be so pleased if you'd review it. Three sections: memoir, fiction and poetry from both established and emerging writers. We love the variety of news and literary updates we get from your blog and posts and your blog is a great place to visit when we want ideas for books from upcoming and established South Asian authors. I havent read the blog, but stumbled upon it on fb, via Sarita, who's a friend. will certainly go through the blog.